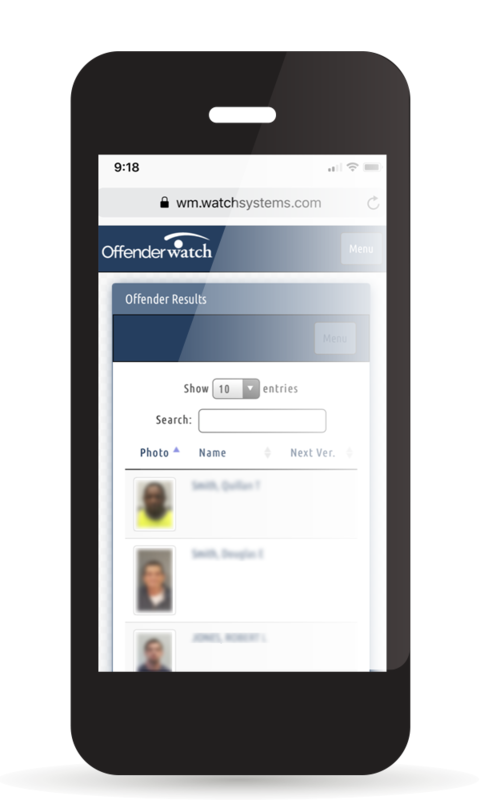 OffenderWatch Mobile is an easy-to-use app for accessing and updating offender records from a smart phone or tablet. Any changes made on the mobile app are immediately transferred to the “master” record historical log, eliminating clerical efforts and building a chronological case of door-to-door address verifications. As users log-in, all of the activity is automatically recorded, including geo-code location, date, time, and duration, as well as comments and notes of the interactions. Quicker compliance sweeps – Officers can verify offender addresses, take photos of vehicles, add investigative notes, and record the time and location-all on site. Supports criminal investigators – Search and view offender images, name, reg. number, risk level, phones, vehicles, home/work/school/volunteer addresses, and criminal history. Quick abduction response – A radial search displays all offenders with a registered address (home, work, or school) within a given radius of your device location. Better use of resources – Assign officers responsible for offender verification by geographic zones or other criteria. Assignments can be placed in a queue assigned for follow-ups. “My Queue” can be mapped along with turn-by-turn directions. Better evidence of verification – Photos and records are location- and time-stamped to prove attempts at verifications. This information is helpful in obtaining warrants. Essential for tracking homeless offenders – Update photos and pin the location in non-residential locations like parks, intersections, or wooded areas. Instant availability – No app to install, no IT support needed. OffenderWatch Mobile works on any Internet-enabled device. Easily update offender records from your smartphone or tablet.